When it comes to keeping our kids healthy, watching food portions and avoiding too much TV are two key factors. Practicing healthy portion control and limiting television time can prevent obesity and will support healthy, happy bodies. 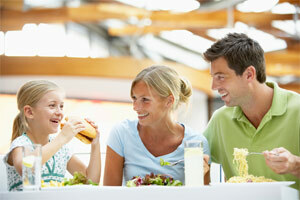 These portion control tips for kids will help you teach your child healthy eating habits. Portion control is a lifestyle choice. Kids model their parents’ behaviors, so it’s important that you practice portion control as well. To understand how much a child’s snack or meal should be, know that a child’s stomach is about the size of their fist, so their snacks and meals should be about that size as well. Additionally, it’s more beneficial for kids’ energy and digestion to eat several small meals and snacks throughout the day rather than three large meals. With this information in mind, here are seven portion control tips. Use smaller plates to prevent kids from being able to put too much on their plate. Let children serve themselves. Research shows that kids tend to serve smaller portions than adults. Avoid telling kids to “clean their plate.” They will stop eating when they’re full. Keep the food in the kitchen rather than on the dinner table so kids can only get food once. Have kids snack on fruits and veggies before dinner so they are less hungry during dinner. Avoid asking, “Would you like some more?” If kids are still hungry, they will ask. Teach them to eat slowly. Eating slower will help kids better notice when they are full. In addition to portion control, another important factor in preventing childhood obesity is avoiding eating while watching TV. Is has been found that when kids watch TV they are more likely to snack on foods that are higher in dangerous fats and sugar. Another danger about watching TV is that kids tend to tune their body signals out while watching TV and therefore don’t notice if they are hungry or not; they just snack regardless. It’s important that if kids do wish to snack while watching TV, make sure you give them something small and healthy. Another good idea is to set requirements like 1 hour of TV means they must have 1 hour of physical playtime. Reading with kids, encouraging conversations and creative play are other good ways to prevent watching TV. Follow the guidelines in these portion control tips for your children so they can grow up happy and healthy.